With the innovative and aesthetically pleasing design of the elegant aluminium housing the infrared radiant heater IRD 3200 is clearly the first choice. With 3,200 W its power is immense, as a result the device can be optimally used in architecturally sophisticated outdoor areas: be it in the refined catering trade or in a sophisticated private ambience. Owing to its minimalistic and classy design the IRD 3200 fits in seamlessly with any environment. With 3 heating levels that can be conveniently set using the IR remote control the high-performance infrared radiant heater covers an extensive heating range and provides cosy warmth outdoors. The effective range of the radiator is further enhanced by the inclination angle that can be adjusted by 90°. Where conventional devices are fitted with a visible, brightly illuminated heater tube, this infrared radiant heater can generate the comforting infrared heat by means of a covered stainless steel heating coil enclosed in aluminium – the heat source is shielded from view. A perfectly elegant solution for areas where additional light would be more of a nuisance as it would clash with the present lighting concept. Feel-good warmth for outdoor areas sheltered from the wind – Find out more about the infrared radiant heaters IRD 1200 / IRD 1800 / IRD 2400 / IRD 3200 in our product video. The clean, condensation-free, odourless and noiseless production of warmth without raising dust renders the radiant heater suitable for allergy sufferers. The device proves to be a superior product for outdoor use, for it comes with IP55 type of protection which makes it dust-, splash- and water-jet-proof. Since the IRD 3200 emits its radiation energy mainly in the medium- and long-wave infrared spectrum, it can distribute heat in an even and targeted manner without heating the ambient air. For this reason it is ideally suited for use in outdoor areas that are sheltered from the wind such as balconies and terraces. As such, it can be applied in the catering trade. The equipment of the IRD 3200 is completed by a 24-hour timer, an operation indicator light and an LED display. An appropriate holder for using the device whilst mounted to the wall or ceiling is also included in the scope of delivery. The device is completely maintenance-free seeing as no illuminant needs to be replaced. 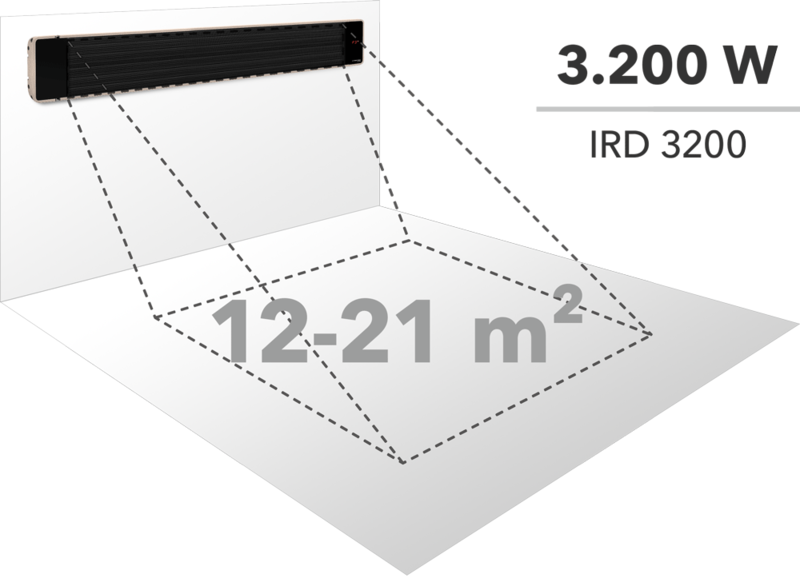 The infrared radiant heater IRD 3200 is supplied in TÜV-tested quality, thus guaranteeing high value, safety and functionality and making sure that you are always on the safe side with Trotec brand quality. The lateral on/off switch and the integrated display indicate the operating status. The integrated holder allows for the device to be mounted to the wall or ceiling. The supplied remote control renders the operation of the IRD 3200 particularly convenient. The head of the radiant heater can be steplessly adjusted to an inclination angle of 90°, thus covering a particularly wide effective range. The IP55 type of protection promises that dust cannot settle within the housing and that the radiant heater can withstand water jets from all sides. The robust design permits both the installation on balconies or terraces and the use at winter sports events. Owing to their dust protection these radiant heaters can also be used in industrial buildings. Ideal for use in hotels or the catering trade: Offer your guests warm seats on an outdoor terrace even in the time between seasons. The IRD 3200 represents a promise you make to your guests that no sudden change of temperature will interfere with their pleasant, restful stay at the wellness hotel regardless of the season. Do not let cold evenings put a stop to a cosy get-together on your terrace or balcony! Der IRD 3200 verfügt über eine gleichmäßige und zielgerichtete Wärmeverteilung, sodass keine Energie an die Umgebungsluft verschwendet wird. So ist der Dunkelheizstrahler mit seiner großen Heizkraft trotzdem sehr energieeffizient. Der leistungsstarke Dunkelheizstrahler IRD 1200 trotzt mit seiner Heizleistung von 1.200 Watt draußen erfolgreich der Kälte. Mit der IR-Fernbedienung lassen sich bequem die 3 Heizstufen bedienen. Der IRD 1800 produziert saubere, kondensfreie, geruch- und lautlose Wärme. Übrigens ohne Staubaufwirbelung, deshalb ist das Gerät auch für Allergiker geeignet. 349.94 € 179.95 € inkl. MwSt. 294.07 € 151.22 € zzgl. MwSt. Der Dunkelstrahler ist in seinem eleganten Aluminium-Design-Gehäuse als innovative und ästhetisch gelungene Lösung die erste Wahl – sowohl für den Einsatz im gehobenen Gastronomie-Bereich wie auch im gepflegten privaten Umfeld.